The most perplexing aspect of the post-Christmas stock rally, which has sent the SPX almost 20% higher from its December lows, continues to confound investors. As we discussed last week, and the week before that, one of the more bizarre observations to emerge over the past nine weeks has been that despite the torrid rebound in stocks so far in 2019, culminating with the best January for the S&P since 1987, investors have shunned US equities, selling stocks when they should be buying, and allocating the proceeds into "yielding" instruments such as bonds and emerging markets, as the following recent chart from Bank of America demonstrated. 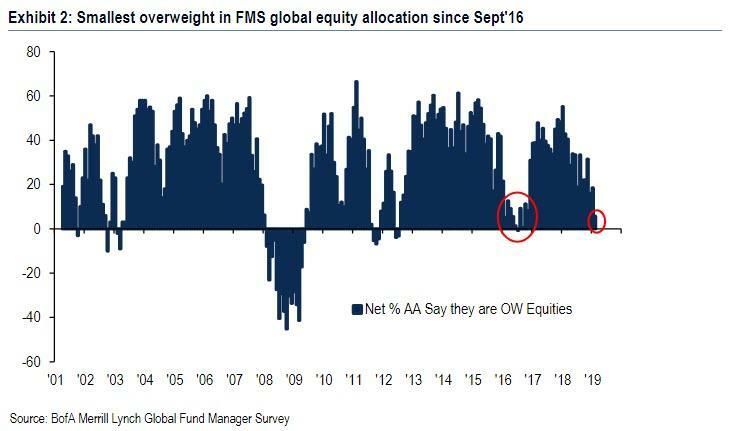 This was confirmed by the latest Fund Managers' Survey from BofA, which found that the allocation to global equities tumbled 12% to just net 6% overweight in February, the lowest level since September 2016, and the biggest MoM drop relative to the performance of global equities (+7% from Jan 4th start of Jan'19 survey) to Feb 7th (end of Feb'19 survey) on record. This confirms that neither professional nor retail investors have any faith in the current rally. And now, according to the latest weekly EPFR data, the conundrum refuses to go away for yet another week, because despite the latest breakout in stocks, which are just a few points away from the "massive resistance" level that is 2,800 but their Sept 20 all time highs, the selling continues unabated, with global equity funds sees another $12.7 billion in outflows ($1.1bn ETF outflows, $11.6bn mutual fund outflows). 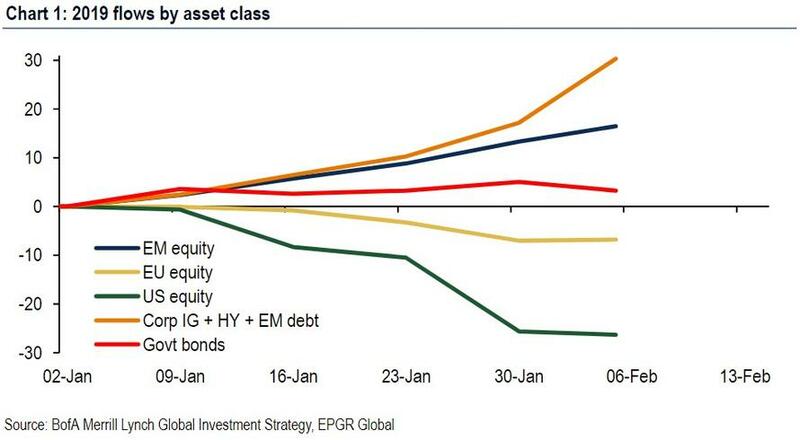 Even more surprising is that the equity revulsion turned broader, as this was the first week of EM debt ($39MM) and equity ($0.5BN) outflows since October 2018, while inflows into IG and HY debt continued, while the now historic redemptions continued from European equity, while financials, tech & energy funds all saw a drop.